It is suggested that legionella outbreaks have increased 450% in the USA over the last 15 years. Legionnaire’s disease is not contagious, although it can be fatal by causing a form of pneumonia. It is formed from an infection by Legionella bacteria found in water and soil. High-risk systems can include cooling towers, steamers, showers, baths, air conditioning units and much more. 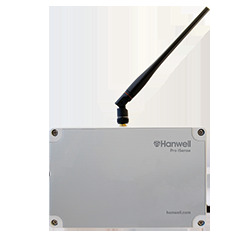 There are many temperature monitoring solutions on the market that may seem to adhere to these requirements, but only Hanwell monitoring systems provide a flexible and reliable solution to internal, outdoor and remote water and soil monitoring applications. Manual monitoring and checking of the conditions that allow Legionella to thrive are time-consuming, laborious and open to error. Here at Hanwell we have developed several semi and fully automated systems and methods for monitoring, reporting and automatic alarming. By mixing a combination of wireless monitoring transmitters and handheld thermometers with barcode scanning technology, preventative monitoring becomes a breeze. Hard to access areas can be monitored with wireless sensors that can measure pipe and tank temperatures as well as flow using non-intrusive ultra-sonic clamps on flow meters. Easier to access places such as washrooms and shower rooms can be fitted with inexpensive thermocouples leading out to a junction box identified with a unique barcode. To take a measurement the handheld is plugged into the junction box and an instant reading is taken due to the thermocouple being permanently mounted. Once the reading is taken the barcode is scanned and data is stored. The handheld data is downloaded by Bluetooth to the central monitoring system keeping all records in one place. Alarms are generated from both wireless sensors and handheld readings alike. For remote offsite locations, our iSense units can be used bringing data into the centralized system using the mobile phone network. Those responsible for water systems have certain duties to meet under Health and Safety law. The Health and Safety at Work Act 1974 (HSWA), Control of Substances Hazardous to Health Regulations 1999 (COSHH) and Management of Health and Safety at Work Regulations 1999 (MHSRW) all cite the HSE’s Approved Code of Practice L8 as the recommended guidelines for the management of risk exposure to Legionella. Wireless System for Legionella prevention. Measuring the water temperature in various areas using a 24/7 alarming and monitoring system, users can quickly prevent the use of breached environments ensuring legionella prevention to the public.